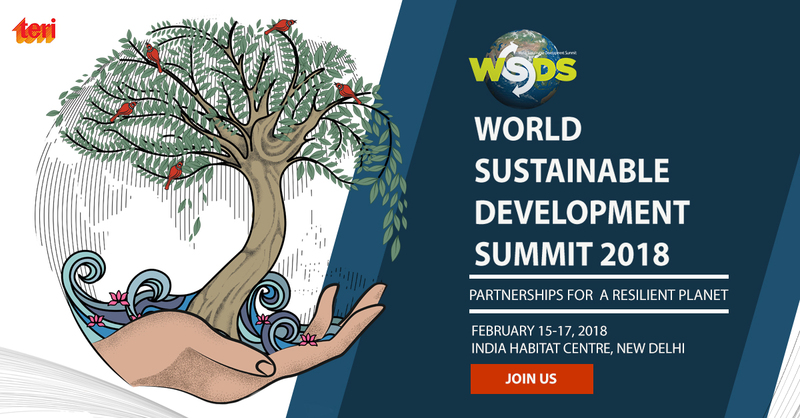 TERI organises the World Sustainable Development Summit (WSDS) 2018, from the 15th to the 17th of February 2018. It is our pleasure to invite you to participate at the Thematic Track Events we are hosting during the Summit as part of the Adaptation Group in TERI. As part of HI-AWARE, there are two events and apart from that there is one more event being planned with a focus on Climate Services. Please find below details of the events for your due reference. 1.) Himalayan Ecosystem Thematic Track event – “The Third Pole – a melting pot of climate change threats and actions” – on the 15th of February 2018 (1330 to 1530 hours) at Magnolia Hall, India Habitat Centre, in Delhi. 2.) “Cities and heat stress – a call for action” Thematic Track on the 15th of February 2018 (1050 to 1230 hours) at Amaltas Hall, India Habitat Centre, in Delhi. 3.) “Climate Services – Navigating into an Uncertain Future” on the 15th of Feb 2018 (1330 to 1530 hours) at the Gulmohar Hall India Habitat Centre, in Delhi. The thematic track events would build on the work under HI-AWARE (http://www.hi-aware.org/), where TERI, along with incountry partners (CEDAR, Dehradun and TMI, Gangtok) are working with various international partners in Bangladesh (BCAS), Nepal (ICIMOD), Pakistan (PARC) and Netherlands (WUR), and seeks to understand the role of partnerships in upscaling and outscaling adaptation in the HKH and its downstream regions. The agenda and the backgrounder is attached for your reference. Your valuable inputs and contributions to the event will help in making it a success. We look forward to seeing you here on the 15th of February, 2018. 1.) Himalayan Ecosystem – through this – http://bit.ly/2rAqcIv – link. Alternatively, you could also drop an email to my colleague, Ganesh at Ganesh.Gorti@teri.res.in.